The nuclear accord "creates conditions and incentives that are highly likely to result in the expansion of what is already an extensive and profoundly dangerous Iran-North Korea partnership in proliferation," Claudia Rosett, journalist-in-residence for the Foundation for Defense of Democracies (FDD), testified before lawmakers on the House Foreign Affairs Committee. As economic sanctions are lifted on Tehran, providing billions of dollars in assets for Iran’s Revolutionary Guard Corps (IRGC) and other entities, Iran and North Korea will be presented with an opportunity to boost their illicit dealings, according to Rosett and others who testified. Rep. Ileana Ros-Lehtinen (R., Fla.), a House Foreign Affairs Committee member, warned that the comprehensive lifting of sanctions on a range of Iranian nuclear and military entities would embolden Tehran’s pursuit of illicit nuclear technology. "We are likely to see an increase in Iran and North Korean activity on ballistic missiles and covert nuclear activities, because not only will we be lifting the sanctions on Iranian scientists and on Iran’s nuclear program, but we will be lifting the sanctions on its ballistic missile program and its military leaders," Ros-Lehtinen said. "And that is where Iran and North Korea are likely to resume their cooperation—on the weaponization and the ballistic missiles." Rosett went on to detail a range of loopholes in the deal that would foster the conditions for greater cooperation between Iran and North Korea. "The administration tells us that the Joint Comprehensive Plan of Action cuts off all Iran’s pathways to the nuclear bomb. That is not true," she said in her testimony. "This deal will not cut off the pathways between Iran and nuclear-proliferating North Korea." In fact, Rosett claimed, the mechanism by which sanctions "snapback" on Iran if it violates the deal "actually make it safer for Iran to cheat." "If Iran is caught cheating, the penalty must come via the United Nations Security Council, where it would be binary—either nothing, or the official reimposition of all previous U.N. sanctions," she explained. "In practice, that could take years to implement, if possible at all. But under the JCPOA, Iran could immediately scrap its commitments, pocket its gains, and walk away." This process incentivizes "the world to ignore cheating by Iran," thereby making it easier for Iran to pursue a relationship with North Korea. "Any country wishing to report or penalize North Korea for clear evidence of forbidden traffic with Iran could be left grappling with the large knock-on prospect of potentially triggering the collapse of the entire JCPOA—and the pressure of the international community to show ‘restraint,’" Rosett said. 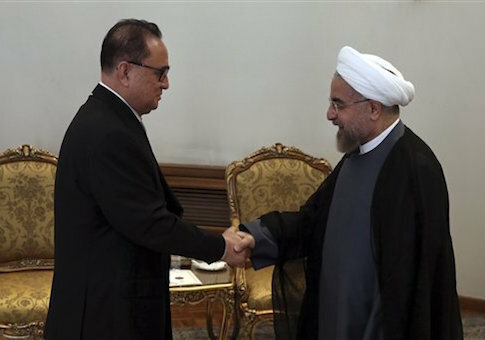 Billions of dollars in sanctions relief also would set the stage for Iran to "go shopping in North Korea," Rosett said. "Iran has done plenty of illicit business in Pyongyang, maintains a large embassy there, and for Iran, a major benefit of shopping for weapons and weapons technology in North Korea is that the authorities won’t protest," she said. "They will be partners on the other side of the deal." North Korea also stands to benefit from the deal as it cashes in on a "jackpot [that] may well augur boom times for the proliferation racket," she said. Issues with the "snapback" mechanism also would enable illicit trade between the two nations. "While the snapback mechanism leaves U.N. member states more reluctant to report violations by Iran, it will become easier for Iran to deal in forbidden goods and services abroad, and harder to detect such traffic—including any weapons-related deals with North Korea," Rosett explained. "Such deals often run through fronts in third countries, such as China, or multiple cut-outs around the globe." Another flaw of the deal is its reliance on Iranian transparency and honesty on the nuclear front, according to Ilan Berman, vice president of the American Foreign Policy Council. "In its terms and provisions, the JCPOA is overwhelmingly focused on the overt means by which the Islamic Republic might attain nuclear status," Berman said in testimony before the committee. "However, the agreement is largely silent on the covert methods by which it could do so." "Thus, even though President Obama has maintained that the deal closes off ‘all pathways’ by which Iran might attain a nuclear capability in the coming decade, experts have warned that a clandestine ‘pathway’ to nuclearization, involving covert procurement of materiel from foreign suppliers, in fact still remains open," he said. This entry was posted in National Security and tagged Ileana Ros-Lehtinen, Iran, Iran Nuclear Deal, North Korea, Nuclear Weapons, Sanctions. Bookmark the permalink.